Are you ready for another year of trading? I know I am! As I mentioned in my Q4 2013 trade reflections, I’ll work on sticking to my system’s strengths and maybe risking a bit more per trade. This is why I’m planning on jumping on GBP/USD’s uptrend. 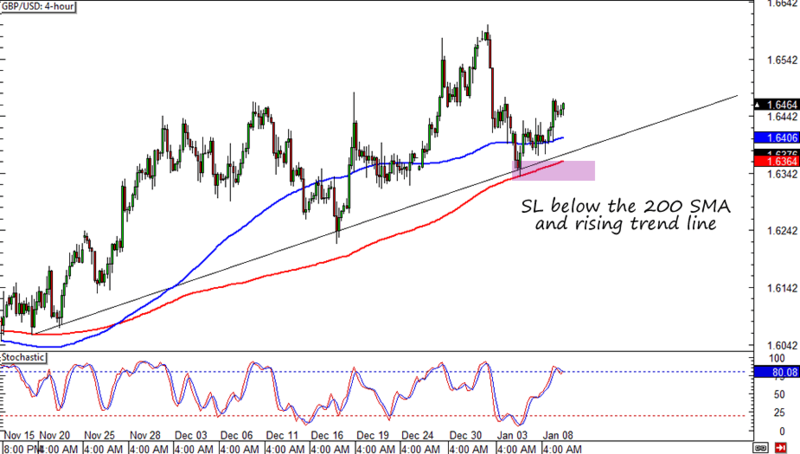 The pair has been riding on a rising trend line since mid-November and has recently tested the 100 and 200 SMAs. On the fundamental side, I believe that the recent disappointments in manufacturing reports are temporary and that overall economic outlook for the UK is still bullish. So here’s my plan. I placed an order (worth 0.50% of my account) at 1.6450 with my stop loss 100 pips away and below the SMAs and the trend line. I would have loved to enter at market but the MPC rate decision is just a few hours away and I’d like to give the pair some room. I don’t have a profit target yet but I’m looking for new highs. What do you think?